The school has an air-conditioned auditorium which can seat 1000 persons. It is well equipped with audio/visual facility which caters to all kinds of activities associated with the school. The children are given ample opportunities to perform on stage and gain confidence. Various programmes are conducted here to expose the children to our rich cultural heritage. 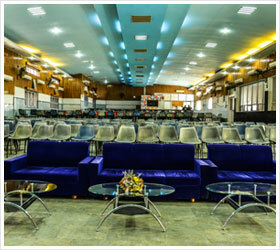 Auditorium is a unique facility in the school which very few schools have. 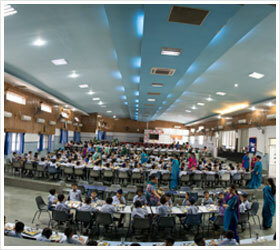 The dining area is vast and spacious, adequate to meet the requirement of the day boarding school. It is manned by a well qualified full time dietician. The kitchen is most hygienic and equipped with all modern amenities. The kitchen and dining hall provide a well-balanced, wholesome vegetarian diet which includes dairy products, vegetables and pulses. Breakfast including milk and lunch are served to the children. The personal hygiene of the staff serving food is ensured. The school has a well equipped medical room with paramedics on duty. Health records are maintained for each and every student. 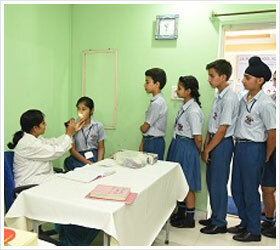 Annual check ups by visiting dentists, eye specialist and ENT specialist are a part of the medical calendar.